Unrecounted is a book of poems and images from one of the most admired European writers, W.G. Sebald, and his friend and collaborator, the German artist Jan Peter Tripp. For a number of years until Sebald's death in 2001, the two exchanged poems and lithographs. Unrecounted is the startlingly original result of this long artistic friendship - a creative dialogue inspired by shared concerns. Tripp's lithographs, which portray pairs of eyes - among them those of Beckett, Borges, Proust - combine with W.G. Sebald's words in Unrecounted to speak of moments salvaged from time passing, of our eyes bearing witness, and of memory and remembrance. 'Condenses Sebald's complex visual imagination to its poetic core' Scotland on Sunday 'Elegiac, enhancing ... Sebald will not be forgotten' Time Out 'A haunting testament to Sebald's singular and lasting vision' Observer 'The magic of W.G. Sebald's incandescent body of work continues to unfold, with this unexpected collaboration' Susan Sontag 'Anyone with a serious interest in fiction should read Sebald' Daily Telegraph W.G. 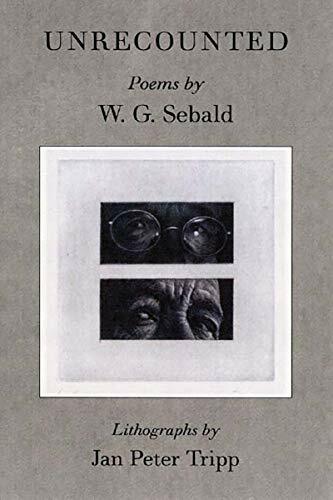 Sebald was born in Germany in 1944 and settled permanently in England in 1970, where he was Professor of European Literature at the University of East Anglia until his death in 2001. He is the author of four works of fiction: The Emigrants, which won the Berlin Literature Prize, the Heinrich Heine Prize, and the Joseph Breitbach Prize; The Rings of Saturn; Vertigo; and Austerlitz, which was awarded the Independent Foreign Fiction Prize and the National Book Critics Circle Award. Alongside this stand books of poetry For Years Now, After Nature, Unrecounted, and Across the Land and the Water, and the non-fiction books On the Natural History of Destruction and Campo Santo. Jan Peter Tripp was born in 1945 and lives and works in Alsace. W. G. Sebald was born in Germany in 1944 and died in 2001. He is the author of The Emigrants, The Rings of Saturn, Vertigo, Austerlitz, After Nature, On the Natural History of Destruction and Campo Santo. Jan Peter Tripp was born in 1945 and lives and works in Alsace.